The Lady-of-the-House has been gazing upon a profusion of green. Spring has dressed the woods around her. So much green does indeed boast blessing and it is gratefully received. Certain months of the year the Lady-of-the-House commonly finds herself slipping into a rut in the kitchen. For efficiency ruts are helpful. It is advantageous to have a repertoire of recipes that you can perform easily. Over time, however, change is welcome to the pallet. In the countryside spring ushers in this change. Recipes follow the dictates of what gardens produce. Up sprouts green asparagus, green onions, herbs and lettuce - lots of lettuce. “I found something you might like,” said the Man-of-the-House. He was searching for an out-of-print book on-line and spotted a book cover with artwork from Edith Holden’s country diary. “Are you interested?” he said. So he upped the order. When The Country Diary Cookery Notes arrived the Lady-of-the-House found the recipes to be traditionally British – no big surprise - but amusingly so. Her first thought was, I wonder if these were the kind of dishes that Beatrix Potter would have eaten. This probably came to mind because she had recently watched - and was enjoyably immersed in - the film “Miss Potter” with actress Renee Zellweger and Ewan McGregor (Although food was far from being a prominent feature.) The other reason is plainly found in the book’s introduction. Here, Alison Harding states that she put together a collection of recipes that would be familiar to Edith Holden (1871-1920) in her day – Victorian to Edwardian. The ingredients are based on what grew in English gardens or what was farmed, fished or trapped locally. Cooks had to use it up in “ well-tried and ingenious ways.” Parsnip cakes, eel soup, oxtail soup, leek pie are mainstay. How about trout with oatmeal for breakfast or a kidney omelet, and grouse on toast with jugged hare for dinner? Entire chapters are dedicated to puddings - to use up eggs – afternoon tea, jams and preserves - to use up fruit. Of these curious old-fashioned recipes, some of the vegetable dishes are inviting. Most of the recipes will likely remain untried. Several she is adapting. But it only takes a few new ideas to make the Lady-of-the-House lug out the pots and pans with renewed anticipation. The Man-of-the-House brought home a couple heads of bib lettuce from a local growers' market. It seemed a little tough for a salad. The Lady-of-the-House could use it for a green smoothie but she recognized that here was the incentive to give her first new recipe - spring herbs soup - a try. It called for a handful of dandelion greens, green onions, a head of lettuce, stock and fresh herbs. (She happened to have some healthy dandelion greens from the Amish grocer on hand.) She used veggie bullion for the stock and then – because the Man-of-the-House likes cream soups - she decided to whip up the soup in the blender when it was cooked, add a dash of coconut milk and a teaspoon of honey. Sitting at the head of the table was the Man-of-the-House. At the start of supper he watched his wife slowly ladle murky green liquid it into his bowl and sprinkle it atop with minced herbs. “Is this a new recipe?” he asked. “Yes, it’s from the new book you found,” his wife informed him. She made the last bit sound as casual and innocent an accusation as possible. “It looks lethal,” he said and made a show of picking up his spoon with uncharacteristic hesitation. The Lady-of-the-House held back a laugh. She held back a laugh and held her breath because although she knew he was kidding, after all her taking-care in the kitchen, she would not give him the slightest satisfaction. She had to know if he liked the soup. “Go on,” she quipped. The woods are a home to wild roses. He brought the soup up to his lips. He did like it. Looks were deceiving for there was a light, springtime freshness to it. The Lady-of-the-House thinks that it was the teaspoon of minced cilantro she used for garnish that contributed to the success. The next day the Man-of-the-House ate the leftovers and so did she. But she wonders when she’ll make spring herbs soup again – next year perhaps. Already the Lady-of-the-House has fitted comfortably back into a rut of making her regular green soup - broccoli with a dollop of sour cream and a pinch of fresh thyme – a green soup that those around her table are most accustomed to. She can see beyond the bend in the road, however, and knows it won’t be too long before she bravely embarks upon another new recipe. Their fragrance is a welcome greeting. The Country Diary Cookery Notes is out of print but across the Atlantic – here in America you can sample recipes from Laura Ingalls Wilder’s childhood, recipes from a similar time period. The following is a review written by the daughter of the Lady-of-the-House. Broccoli soup with thyme and sour cream. When I open The Little House Cookbook, memories of my childhood come flooding back. 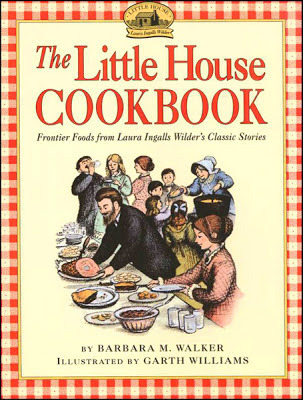 Passages from The Little House Series accompany each recipe and so do the beautiful pencil sketches by Garth Williams that are so familiar to me. I especially remember the passages from Farmer Boy that my mother read aloud to us. I can almost taste the apple turnovers, buckwheat pancakes, crackling cornbread, and stuffed roasted hen. One winter Mom helped Sophia and me make molasses candy in a pan of cold gathered snow - just like Laura and Mary. I am delighted to find the recipe for it in this cookbook. The Little House Cookbook, with its story passages, illustrations and more than 100 well-researched pioneer recipes, will inspire you to bring simple, wholesome, frontier food to your table. For ages 8 and up.